The Materials Exchange is a free service that links organizations that have reusable goods they no longer need to those who can use them. This business reuse network helps prevent usable materials from becoming waste and saves users money. The program is operated as part of the Minnesota Technical Assistance Program (MnTAP) at the University of Minnesota. MnTAP provides tailored pollution prevention and energy efficiency solutions for Minnesota businesses. View listings: You can view listings (available and wanted) without signing in. Click on "Exchange" at the top of the page and click between the tabs under "All Listings" to view different types of listings. Post listings and contact users: Sign in or create an account to post listings and to view contact information for listings. University of Minnesota employees and students: Create an account with your @umn.edu email address to access the University's private exchange. When you sign in with an account associated with your @umn.edu email address, you will see the University's private Virtual Warehouse under Exchange by default. 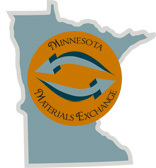 To view non-University listings, select "All" or "Minnesota Materials Exchange" from the drop-down menu at the top of the exchange. Remove listings and report exchanges: Please remove listings when they are no longer available or wanted and indicate the outcome of your listing. Please report exchanges. By submitting your listing, you agree to the following rules and policies. You have the legal responsibility to determine whether a listed material is a hazardous waste or a hazardous material. THE UNIVERSITY WILL NOT MAKE THIS DETERMINATION. Hazardous and solid wastes must be managed in accordance with all relevant regulations and laws. You may view our User Agreement here.